Sought for comment, De Lima, chair of the Senate committee on justice and human rights, said the latest names aired by Duterte in a speech early Sunday should be pursued in court if there was evidence, as the law dictated. 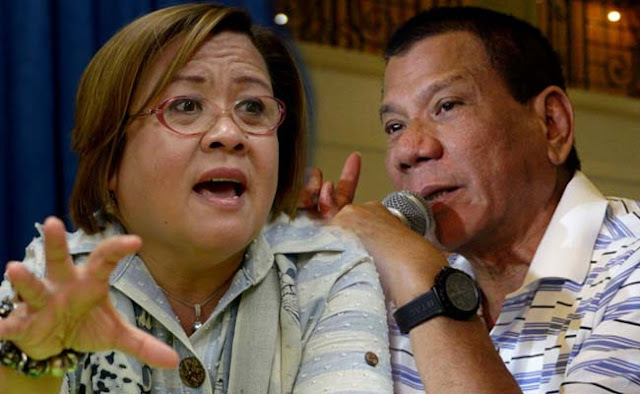 “To be honest, it’s difficult to pass judgment on the style of the President, especially that a great majority of our people seem to approve of this naming and shaming strategy,” De Lima told the Inquirer when reached yesterday. “Having said that, as a student of constitutional law, let me express these thoughts: If there is evidence against these people he has named and shamed, cases should just be filed against them so that warrants for their arrest can be issued. If there is no evidence, then this is a plain and simple witch hunt,” she said. The lawmaker, who recently appealed for an end to the string of deaths of suspected criminals, warned that being publicly named as a drug suspect was “already a death sentence,” given the President’s standing “shoot-to-kill” order on narco-politicians who would resist arrest. “We are already in the slippery slope towards tyranny, without martial law, when we allow one man to be judge, jury and executioner. This is just the start,” De Lima said. “The end game is just too terrible to imagine, when anyone can be accused and shot on sight based on a list that has the same legal value as a grocery list,” she said. De Lima is set to conduct a legislative inquiry on the spate of killings of drug suspects in police operations and vigilante-style executions amid Duterte’s drug war.